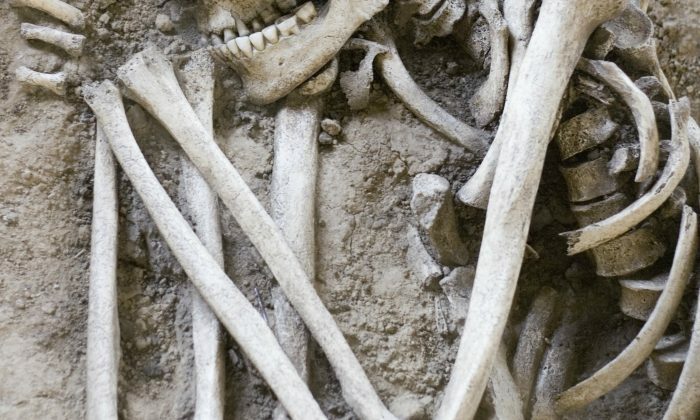 Since 2013, the team has reported finding half a dozen human skeletons dating to the early 1400s and the mid-1500s that measure between 7 feet and 8 feet (213 to 243 centimeters) in height. In late 2013, Dement received word that a skeleton had been uncovered by a Shuar local, approximately 70 miles (112 kilometers) from Cuenca, in Loja Province, Ecuador. Dement traveled to the site and recovered the rib cage and skull of a female which had been exposed by flooding. The bones were thought to date to 600 years ago. The rest of the skeleton was located and, once assembled, reportedly measured 7 feet and 4 inches (223.5 centimeters) in height. This prompted the formation of a research team including four researchers from Freie Universität in Germany, and the assistance of Shuar locals. Funding was provided by the university for excavation and investigation. Because of the sensational nature of this, we have to be extremely diligent in our research. “Because of the sensational nature of this, we have to be extremely diligent in our research since it will be met with a great deal of skepticism,” he said. Three complete skeletons and two partial skeletons had no disfiguration and they were relatively healthy. Did Giants Exist? Part 2: Where Are the Skeletons Now? Did Giants Exist? Part 4: Were Giants Responsible for the World’s Ancient Megalithic Structures? The burials were elaborate. Bodies were wrapped in leaves and buried in thick clay. This sealed the skeletons and protected against water intrusion, leaving the remains in fairly good condition. Since the announcement of this discovery, several reports have vastly exaggerated the dimensions of the finds, with 7 feet reported as 7 meters (making them 23 feet tall). The bones have also been erroneously connected with hoax photos, as well as a reconstruction of an “Ecuador giant,” which was a fake skeleton for a now-closed theme park in Switzerland. Dement had previously studied Amazonian indigenous communities for more than two decades and had heard the legends of “very tall, pale-skinned people who used to live nearby,” he said. Community elders described them to Dement as a race of large, peaceful Amazonians who were welcomed by the indigenous Shuar and Achuar people. However, the locals also believed these people belonged to the “spirit world” and were purely mythical. Visit the Epoch Times Beyond Science page on Facebook and subscribe to the Beyond Science newsletter to continue exploring ancient mysteries and the new frontiers of science!